The real world is a complex place, resulting in complex requirements for any system that has to work there. This is true regardless of development paradigm. Although "agile in the small" methodologies such as Scrum and Extreme Programming (XP) have done much to show us how to improve our approach, too many people have thrown out the requirements management baby with the bureaucracy bathwater after putting too much faith in the overly simplistic strategies of those processes. Luckily, with a bit of discipline, it is straightforward to address the inherent challenges of complex requirements in an agile manner without resorting to the documentation-heavy practices favored by the traditional community. The Scrum method has popularized the idea of managing requirements as a stack of small, functional chunks, captured in a prioritized stack called a "product backlog". The idea is that at the beginning of each iteration/sprint, you pull an iteration's worth of work off the top of the stack. If only it were that easy. Although Scrum has helped us to get away from the onerous change prevention strategies (oops, I mean change management strategies) of traditional methods, it has blinded a generation of developers to the inherent complexities and nuances of understanding and implementing requirements. Scrum's product backlog concept works well for simple functional requirements, but as I described in "Beyond Functional Requirements on Agile Projects" (www.ddj.com/architect/210601918), it comes up short for nonfunctional requirements and architectural constraints. These types of requirements are addressed through three strategies: initial architectural/requirements envisioning, continuous independent testing, and education. Not only do agile development teams implement new requirements during an iteration, they also fix defects and perform other nonrequirements work. Figure 1 depicts the OpenUP's (www.eclipse.org/epf) work management strategy, an extension to Scrum's product backlog strategy. The first thing that you should notice is that it's not just a product backlog but also a stack of work items. A work item is often a small functional requirement, such as a user story or feature, but can also be a defect or a nonrequirement item such as reviewing the work of another team, attending a training session, or setting up equipment. In "Scaling Test-Driven Development" (www.ddj.com/architect/205207998) I showed how disciplined agile teams will have an independent test team working in parallel to the team, validating new builds as they're made available, and reporting defects back to the development team. By treating defects as a type of requirement that gets prioritized, estimated, and put on the work item stack, you can simplify your change management process by in effect combining defect and requirements management into one. Furthermore, although you can try to plan for nonrequirement work items by fudge factors in your planning game efforts, the reality is that these fudge factors will vary between iterations because these sorts of work items don't occur as a steady stream throughout a project. To see this work item backlog strategy in action, you can download a trail version of Rational Team Concert (RTC) from www.jazz.net, which integrates this functionality into a Eclipse-based development environment for distributed agile teams. 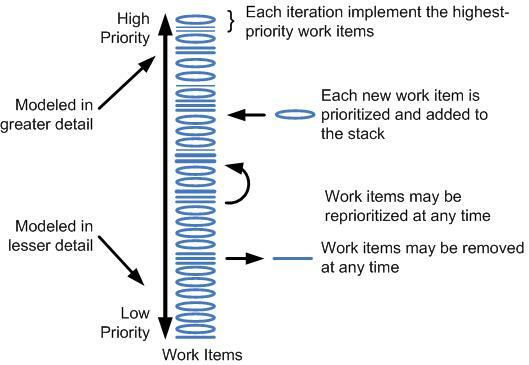 Figure 1: Work items are addressed in priority order on disciplined agile projects. Another extension captured by Figure 1 is the explicit recognition that you should look down the work item stack an iteration or two for potentially complicated work items. When you find one, and they do occur, if it is close to being popped from the top of the stack, it behooves you to follow Agile Modeling's Model A Bit Ahead best practice (www.agilemodeling.com/essays/bestPractices.htm) and explore that work item and thereby avoid being blindsided by it. Although this can sound like heresy to agile purists, as we saw in DDJ's 2008 Modeling and Documentation survey (November 2008), it is quite common for Agilists to model. On the surface this may appear to go against Extreme Programming (XP)'s philosophy of having the courage to worry about tomorrow's problem tomorrow. Although this type of machoism might make developers feel good about what they're doing, and it is certainly an excellent juxtaposition to the risks inherent in detailed up front modeling, when taken to the extreme this philosophy proves to be an incredibly poor strategy in practice because sometimes complex work items can put your project at risk if you're not expecting them. Remember that nowhere in XP or Scrum does it say to be stupid, so don't be afraid to extend those methods with proven practices from other sources.